This stuff smells delicious and is one of my favorites. It is a must have when you have kids in school (bringing home germs Monday through Friday). I love this soap and so does the rest of my family. The soap smells amazing, doesn't dry out your hands like some other soaps do and is affordable. We have this soap in every bathroom in our home. It's a great product and it is the only one I use at home! I have tried a lot of hand washes. But this one felt different. It was so moisturizing. And best part is- can wash off oil in just one pump. This is a nice hand soap! I tried this soft soap awhile back and it wasn't too bad. I liked that it was a little thicker than some of the other soft soaps out there. The smell of milk and honey was better than I thought that it would be. It's a nice refreshing scent. The bottle is a good size and the pump on the bottle works well also. It's easy for kids to use as well. I like to mix my hand soap scents up a bit, so this was a nice change. 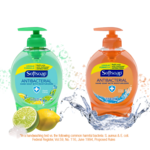 The soft soap brand is inexpensive and can be found at most stores. I would buy this product again. It lathers well and gets your hands really clean. I also like the moisturizing part of it. It doesn't leave your hands feeling dried out. I liked it. Effectiveness It's effective in getting your hands clean and germ free. It also does a good job of keeping your hands from feeling dried out and with moisturizing them. Scent The scent was a little different then I was used to, but it was a nice smell. It was a refreshing and soft scent. I never had used a moisturising hand soap before as I had assumed that all hand soaps were the same, but the Soft-soap Milk & Golden Honey Moisturising Hand Soap changed my perceptions, it really is different amongst the other ranges of soaps. 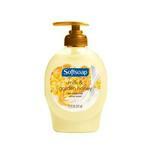 The Soft-soap Milk & Golden Honey Moisturising Hand Soap has such a lovely strong scent. I like the moisturising component in Soft soap Milk & Golden Honey Moisturising Hand Soap as my hands tended to dry out sometimes with over washing. It did not irate or dried out my skin at all. It always left my hands superbly clean with the pretty fragrance lingering long after washing your hands. This hand soap is available in many stores and it is priced affordably for the size of the bottle it is sold in, not ranged too high like other brands. I would recommend this hand soap because of the moisturising bonus, for its lovely smell which Soft-soap sells in different scents if you're not too keen on milk ad honey, it is something worth trying amongst the moisturising hand soaps ranges. Softsoap Milk & Golden Honey is a great sudsy hand cleaner. I am currently using this soap, Softsoap Milk & Golden Honey Moisturizing Hand Soap, and have had nothing but good experiences with it. The unbreakable plastic bottle currently sits on my bathroom sink and looks very attractive there in it's yellowish orange container. The very rich and thick looking deeply colored yellow soap is seen through the transparent container and looks like and is a dream come true for washing and moisturizing dry hands. Being that my skin is plagued with dryness from a skin condition called psoriasis, I need a highly moisturizing soap to keep my hands clean as well as keep them from drying out, especially during the cold winter months when my skin tends to get chapped. The only drawback I can think of to this product is that the soap tends to dry in the dispenser pump if you don't use it every day, but thats not a problem, really. You might have to break off the small clump of dried soap from the dispenser tip and then, voila, it's pumping freely again. I found the bottle lasted an adequately fair amount of time before running out. You can add water when it's nearly gone and the get the last drop of soap out and it is still sudsy and rich. The lather is wonderfully plentiful, the soap is a great and effective cleaner, and the scent is mild enough to please yet not too strong to overpower your senses. A very indulgent product to treat yourself with at a moderately low price. I love and recommend it. Effectiveness definitely does the job cleaning without undo drying. Scent Perfect for my taste. The name, Softsoap, is perfect for this line of hand soap products. 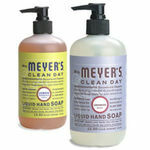 I first purchased this scent of their hand soap line nearly 4 years ago and have been using it ever since. Prior to using Softsoap I had not seen the importance of having two different types of soap: one for dishes and one for hands. I thought, "It's all soap. It all cleanses. What's the big deal?" Then I was given a box of household items when my husband and I moved to Virginia. In the box was a little pump bottle of this Milk and Golden Honey hand soap. My opinion on the importance of hand soap was immediately changed! I have always suffered from dry skin on my hands, especially during the winter. Of course, dish soap makes it so much worse. Using the softsoap allowed me to use less lotion, and also allowed my hands to heal in between washes. It did not strip all the essential oils out of my skin, and added some moisture due to the product's own ingredients. As to the scent, I had a girlfriend come visit and after she used the bathroom she said, "Wow, your soap smells so good! I just can't stop smelling my hands!" I agree. The smell is mild, but very pleasantly clean. Softsoap Milk and Golden Honey soap is a household favorite and has a lasting place in our home. I was incredibly please when I used this hand soap. It truly moisturizes your hands and makes them feel awesome. It is one of the best hand soaps I have ever used. The smell is incredible. It smells like a sweet honey scent. It would leave my hands smelling awesome all day. It also works to really kill off germs. I am a teacher so I am constantly exposed to germs. I felt like this hand soap did a great job at killing off germs and keeping me healthy. The price on this is great too. It lasts you a long time. It is certainly worth the price you pay for it. Effectiveness I found this soap to be very effective for me. It kept my hands clean and helped them stay moisturized. It definitely was effective at killing germs. It was also effective at keeping my skin from getting too dry. I would definitely recommend using this soap. Scent The scent is incredible. The milk and honey combine really well to make an awesome scent. It is a sweet smell but it is not overpowering.